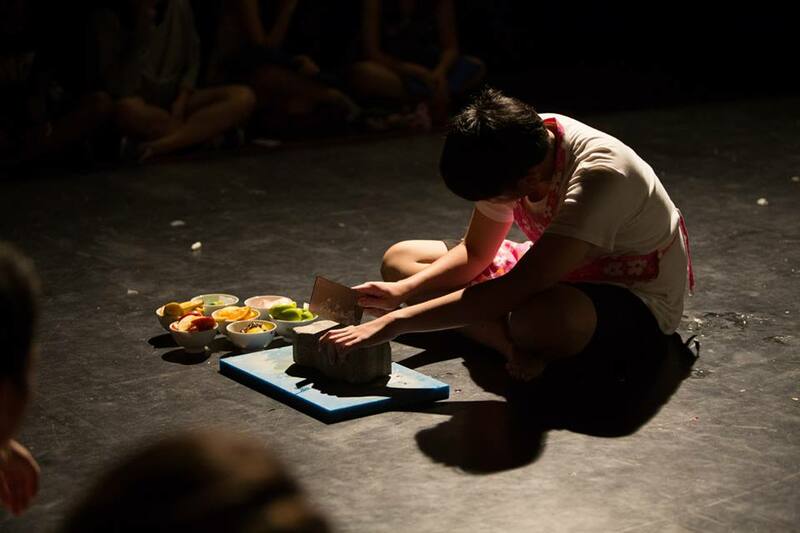 In keeping with tradition, this year’s J1s staged their annual batch production, The Chopping Board Plays at the TSD Black Box, which made for an immersive and intimate experience for the audience members right off the bat. The plays were tailored to suit the venue, to the extent that, as vice-chairman Rachel Koh (15A01A) observed, “many of these plays would not have worked outside of a black-box setting.” In truly surreal fashion, the production began with Players chairman Mohamad Rafi B Kamsani Chia (15S07D), clad in a pink floral apron, chopping vegetables and fruits. However, the items he took his cleaver to were increasingly bizarre, escalating from food to a tube of toothpaste to a concrete brick. Having attempted to saw through the brick for several minutes in vain, Rafi threw the chopper on the ground in frustration and stormed off as Bohemian Rhapsody began to play in the background, foreboding the themes of grief and loss that unified the night’s triple bill. The tension in the air provided an appropriate backdrop to the first of the three plays in the triple bill, “Philosophising Over A Dead Baby Body”, which had a puzzling title for a correspondingly absurd story. This play revolved around Igor, a deadbeat man who tries to rationalise his inadvertent murder of his only son, Ditto, through his own strongly convicted perspective. Written as a commentary on dogmatic worldviews, we interpreted the motif of the bisons and their animalistic loyalty as a hypothetical representation for the emotional lenses that typically colour our understanding of reality. Dialogue between Igor and his overzealously supportive wife, who insistently attempted to rescue him from his self-directed blame, further revealed the fallacious reasoning that people are prone to in the aftermath of tragedy. Given the heavy philosophical overtones that dictated this play, it was no surprise that this play met with ambivalence from the audience. Director Celeste Tan shared that a large portion of the script, featuring amongst others a bizarre dance segment by Joel’s character, had been sheared off a mere two days before the first staging in the interests of logistical suitability. This last-minute decision may have occluded the play’s message, contributing to some audience members’ confusion. 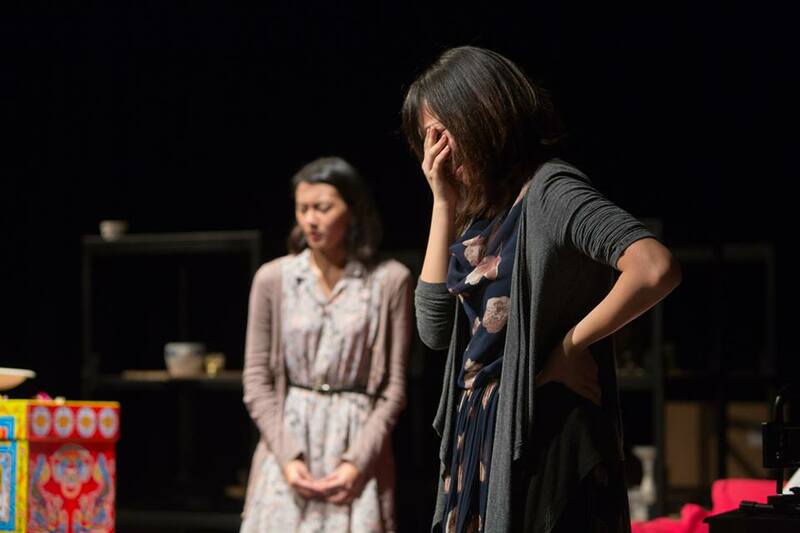 Mitchell Kwong (15S03H) said that he found the first play “very confusing” and had “no idea what was going on”, while Ms Lye Su-Lin remarked that she was “not sure the first play fulfilled its function”. On the other hand, Gabriel Ng (15A01B) felt that it was the “best play of the night”, while Elaine Wijaya Oey (15S06Q) found its whimsical illogic entertaining, which was undoubtedly gratifying for the cast and crew. In contrast, we found the second play of the night, “The Walls Are Too Thick”, a more measured take on the central idea of loss and separation. 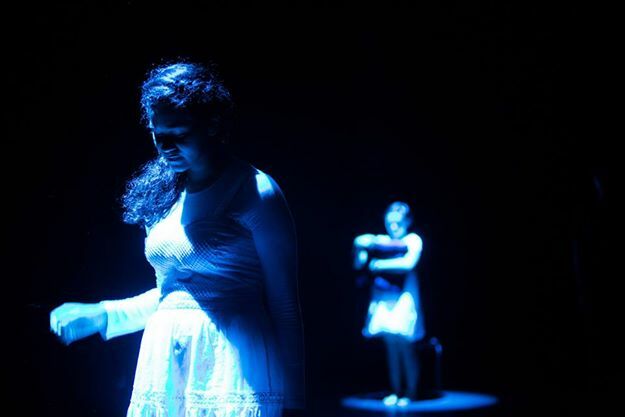 This play confronted the themes of childhood and lost innocence, as Macy and Jo find themselves abruptly catapulted into a mysterious room with no doors and a bottle of pills on a table. Slowly, the two sisters unravel their father’s affair and abuse of their mother, demonstrating the burdensome weight of maturity. The twist at the end revealed that the family were involved in a fatal car crash which killed both parents and which left Macy in a coma – Jo was revealed to be a figment of Macy’s imagination, and a metaphor for Macy’s desire to reclaim her lost innocence. The audience were generally appreciative of the non-linear progression of the play, which allowed the audience to slowly piece Macy’s backstory together based on clues dropped throughout the play’s progression. As scriptwriter Rafi told us, this was a conscious decision on his part midway through the rehearsal period. 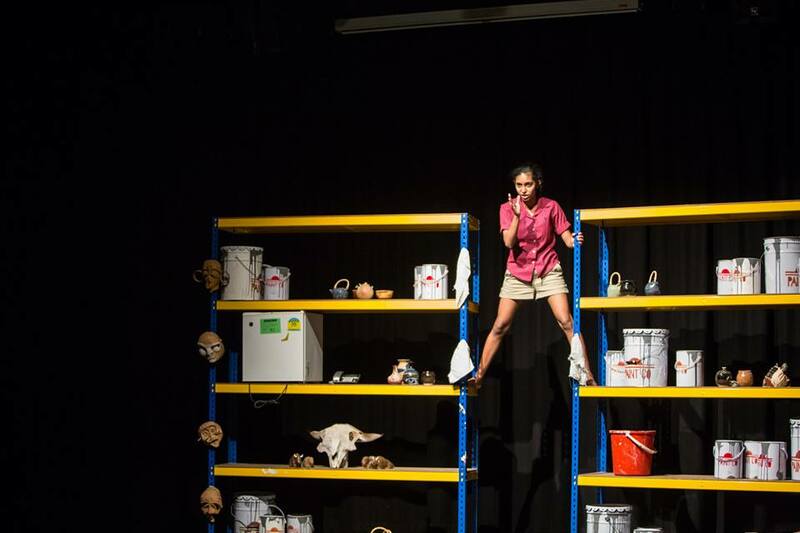 “There was one day I decided to cut up my script and ask [the cast] to read it randomly in pieces…and then that became the final script.” We were also impressed by the meticulous direction of Rebecca Goh (15S06O) for the play. In particular, there were reportedly over 30 lights and sounds cues for this play alone, which were all effectively used to portray the changes in location during the play from a car to a playground to the titular rooms with its too-thick walls. Some particularly outstanding moments were the blue and red spotlights that temporarily illuminated the actors as they rapidly moved around the stage, creating a palpable aura of mystery and fear. The impressive command over the technical cues was testament to the Players’ skill in maximising the TSD’s potential. In addition, Annaajihah Bt Muhamad (15S03D) convincingly managed to portray Macy as a complex character, at once the protective elder sister as well as the daughter scarred with the knowledge of her father’s infidelity. Equally compelling was Katrina Jacinto (15A13A) as the imaginary Jo, who brought a fresh dimension of childlike curiosity and inquisition onto the stage. She was able to actualise the process of growing up that the script audaciously set out to do. The chemistry between the two main characters was evident in the scenes where the two exchanged lines at bullet-speed. And who can forget Macy’s haunting descent into madness in the last scene, which left audience members enthralled and discomfited all at once? Even without the deadpan humour of “Philosophising Over a Dead Baby Body”, we felt that this play did justice to the sombre themes it grappled with. Of the night’s plays, perhaps the most compact and well executed was the third and final piece, again scripted as well as directed by Jovi Tan (15A01B). Following a straightforward and linear narrative, the play was a slice of protagonist Nina’s life as she attempted to deal with the loss of her husband amidst her sister’s growing frustration at her inability to return to a semblance of normalcy. Rachel Koh portrayed the role of Nina, a quietly grieving widow, with finesse, cycling between outright anguish and inert helplessness at her own situation. Her emotional fragility was made all the more apparent in scenes with her sister, played by Syafiqah Nabilah (15A01B), whose well-intentioned care, interspersed with moments of awful frustration, highlighted the limits of familial empathy. 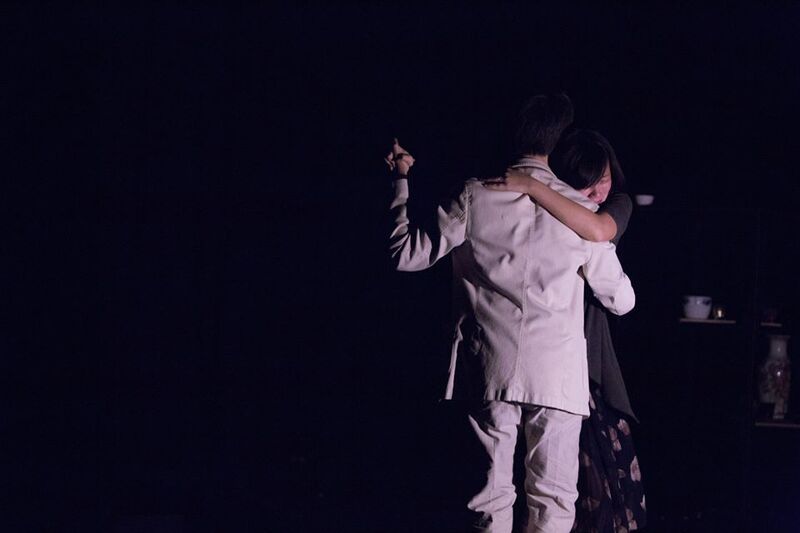 There were some precious moments in this particular play that we greatly enjoyed, most notably the bittersweet scene in which Nina dreamt of her dead husband, played by Jovi, returning from a journey with suitcase in hand and them enjoying a last waltz together. The two began by dancing at tangents to each other, and drew closer until they met and danced in a slow circle for a few moments before their inevitable separation. Nina then attempted to pass her husband a few religiously significant mementoes that she picked up at a thrift store in exchange for her husband’s old possessions, to no avail. For most audience members, this brief scene alone was enough to convincingly flesh out Nina’s wistful nostalgia and lingering love. With all three plays, we were bowled over by the sheer amount of thought and dedication put into the entire production, made all the more impressive by the fact that the Players put this production together even as they were rehearsing for their Oral Presentations. We applaud Raffles Players for this ambitious yet cogently executed, impactful and thought-provoking year-end performance, and look forward to their upcoming endeavours in Dramafeste next year.